It’s no secret that while genome-wide association studies (GWAS) have implicated thousands of genetic loci in human phenotypes, the variants uncovered collectively explain only a fraction of the observed variance between individuals. The reasons for this “missing heritability” are a subject of vigorous debate in the scientific community. One possible explanation is that rare (low-frequency) variants — which are poorly represented on the arrays used for GWAS — underlie a substantial proportion of the variability. This idea is intuitive: in theory, large-effect variants would be kept at low frequency by natural selection, a pattern that’s well established for mutations that cause rare single-gene disorders. It also makes a strong argument for large-scale sequencing for common complex disease, which is the purpose of the NHGRI’s flagship CCDG program. The problem, of course, is that we can’t really understand the contribution of low-frequency variants to human disease without actually performing such an experiment. A new study in this week’s issue of Nature represents one of the first and highest-profile attempts to do so for a common disease. Type II diabetes (T2D) affects 29 million people in the United States (according to the CDC), which is about 9.3% of the entire population. It also has a strong genetic component, and has thus been a priority GWAS target for over a decade. So far, GWAS efforts have reported 80 robust associations, largely involving common (MAF>5%) variants that have very small effects on disease risk. I think it’s important to point out the nuance of whole-genome sequencing coverage. Generally, we target 30x coverage for a whole-genome of a germline (i.e. non-tumor) sample, which provides excellent power for variant detection. Some groups have touted 20x as a possible minimum threshold, and I’m comfortable with that. But low-coverage (5x) whole genome sequencing is a whole different animal. WGS coverage is like a bell curve: while many positions will have 5x coverage, some will have 1-3x and some will have 7-10x. Even for this group of authors, which include some of the top experts on NGS variant calling, this presents a significant challenge for variant detection. Simply put, at 5x coverage, a number of rare and/or hard-to-call variants (e.g. SVs) will be missed. 26.7 million variants were detected, genotyped, and phased, including 1.5 million small indels and 8,876 large (>100 bp) deletions. Individuals harbored an average of 3.30 million genetic variants, including 271,245 indels and 669 deletions. 420,473 common SNVs and 2.4 million low-frequency SNVs were poorly tagged by genotype arrays (r-squared < 0.30), and thus haven’t been interrogated by any T2D GWAS to date. 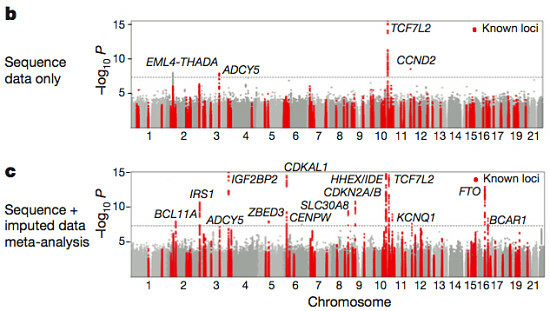 The primary association analysis uncovered 126 variants at 4 loci that were associated with T2D, three of which were known. EML4 was novel, but when the authors imputed sequencing variants into a much larger sample collection (44,414 individuals from 17 other studies), the association didn’t hold up. Another novel signal (CENPW) did appear, and this was replicated in an independent cohort. In summary, the meta-analysis of sequencing and imputed data examined 26.7 million variants in over 47,000 individuals of European ancestry. That’s a massive association study with extremely high resolution, yet it recapitulated only 13/80 loci (16%) known to be “robustly associated” with T2D, and uncovered only one new locus. I find that a bit discouraging, and I’m sure the authors did, too. Single-variant testing yielded only a single significant result, (PAX4 p.Arg192His, a.k.a. rs2233580) that was only observed in East Asian individuals. 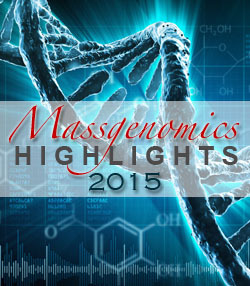 Gene-level aggregation testing yielded no exome-side significant finding. Limiting the analysis to 634 genes in known associated loci uncovered an association (FES in South Asians, driven by a single likely-causal variant) that met the more forgiving threshold for significance. To increase power, the authors integrated SNP genotypes from 2.5 million sites in about 79,000 additional cases and controls (all European ancestry) obtained using a custom Illumina SNP chip. Integrating these with the exome data yielded an exome-centric dataset of more than 90,000 individuals. Some 18 variants at 13 loci exceeded genome-wide significance, but all were common (MAF>5%), and only one (MTMR3) was outside of known GWAS loci. Back in 2010, Goldstein and colleagues proposed the concept of “synthetic association” — the idea that common GWAS signals may be due to individually rare causal variants which cluster on certain common haplotypes. The thinking was that sequencing in GWAS regions might therefore reveal all of these causal variants. This would offer an intriguing explanation for the fact that most lead GWAS hits lie outside of coding regions. It might be possible that nearby rare causal variants were in LD with the tag SNP, and these (not the tag SNP) exerted the causal effect on disease risk. The authors tested this hypothesis in T2d using the WGS dataset for 2,657 individuals, which they describe as having “near-complete ascertainment of genetic variation.” They took the 10 T2D GWAS loci with the strongest support in their study, and looked for low-frequency missense variants within 2.5 million base pairs of the common index SNV. None of the loci showed supporting evidence of “synthetic association,” and 8/10 were convincingly not consistent with the proposed phenomenon. Thus, while synthetic association might well underline common GWAS signals for other phenotypes, it does not appear to do so for T2D. To model the disease architecture of T2D, the authors conducted an elegant experiment. They simulated three possible models which had seemed plausible prior to large-scale sequencing, and computed the number of associated low-frequency and rare variants that would be uncovered with their study design. 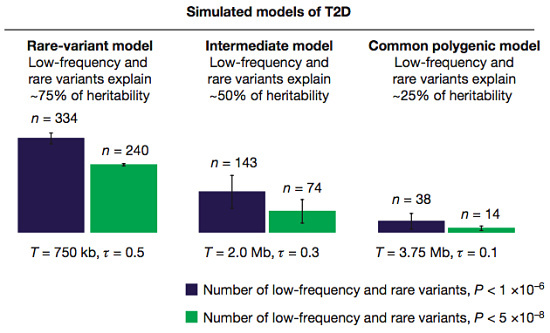 In the first two models, low-frequency variants explain a significant proportion of the heritability, and over a hundred of them should have been uncovered at the more forgiving significance threshold. In a third model, where rare variants make a minority contribution, they’d uncover only a few dozen. Next, the authors compared these outcomes to their actual results. Only 23 low-frequency and rare variants achieved significance, which is nowhere close to the first two models (the ones that suggest a major role). It’s most similar to the common polygenic model of disease for T2D, suggesting that this study supports a minor role for rare and low-frequency variants. Overall, I found this to be a comprehensive and extremely well-written paper of the caliber we’d expect to see in Nature. It represents years of work by more than 300 contributing authors, and probably the first study of many to come. While the number of new discoveries may be a tad disappointing, the authors have uncovered novel loci and secondary signals. They’ve also done a great deal to shed light on the genetic architecture of this common complex disease, particularly as far as coding variants are concerned. We will need, and I hope to see, many efforts like this to understand the genetic architecture of other diseases and important human traits. Not so long ago, there was a hope in the research community that common genetic variation, i.e. variants present at minor allele frequencies >5% in human populations, might explain most or all of the heritability of common complex disease. That would have been convenient, because such variants can be genotyped with precise, inexpensive, high-density SNP arrays in tens of thousands of samples. Sadly, the human genome doesn’t play that way. Genome-wide association studies have implicated hundreds (if not thousands) of new loci in common complex disease. Yet most of the identified variants had a very small effect on risk, and they collectively explained only a fraction of disease heritability. One possible explanation was that rare variants, which are largely untested by high-density SNP arrays, might account for some of that missing heritability. Yet large-scale sequencing studies of common complex disease have not been financially viable until very recently. As we forge ahead with the Alzheimer’s Disease Sequencing Project, TopMed, CCDG, and other projects, it’s promising to see results like those in the common/rare variant association study recently published by the International AMD Genomics Consortium. Age-related macular degeneration (AMD) is the leading cause of blindness, affecting about 10 million patients worldwide. It’s a progressive disease whose biological underpinnings are still not well understood, and therapeutic options are limited. Like most age-related diseases, this is a complex phenotype with numerous risk factors, but there’s clearly a substantial inherited component at play. 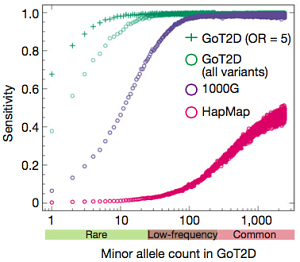 As of last year, GWAS efforts had uncovered 21 loci in which genetic variation affects disease risk. Translating these into biological insights (or better yet, therapeutic targets) has been challenging. The 52 associated variants roughly double the number of genetic loci for AMD. The vast majority of them (42/52) are common, with MAF >1% and relatively small effects on risk. The odds ratio (OR) which measures the relative increase/decrease of risk conferred by such variants, ranges from 1.1-2.9. Yet the authors also observed 7 significantly associated rare variants (MAF<1%) with odds ratios of 1.1-47.6. All seven were located in or near complement genes (that’s “complement” as in the innate immune system complex), which had been implicated in AMD by sequencing studies over the past couple of years. Four genes also exhibited a significant burden of rare damaging variants, suggesting a functional link to disease risk. Notably, three of those four burden signals were due to variants with frequency <0.1%, suggesting that trait-associated variants with clear functional consequences might be even rarer than we’d guessed. The corollary, of course, is that sample sizes will need to be much larger to detect them with any kind of power. 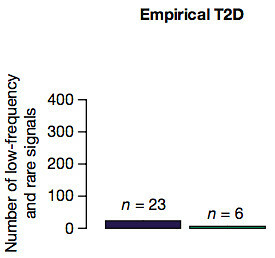 One of the rare variant burden genes, TIMP3, was previously associated with Sorsby’s fundus dystrophy, a rare disease similar to AMD but with earlier on set and Mendelian inheritance. The Mendelian disease variants occur largely in exon 5, but the IAMDGC’s study uncovered a number of rare variants of the same class (nonsynonymous changes disrupting cysteine residues) in other exons in AMD cases. Carriers of such alleles also had a burden of other AMD-associated variants, suggesting that TIMP3 variation contributes to disease risk in conjunction with other variants. It’s a cool example of variation in the same gene giving rise to monogenic and complex disorders with similar clinical presentations. I like this study because it demonstrates the importance of looking at both common and rare variants, in a large number of samples, to more comprehensively interrogate the genome for complex disease loci. It sets the stage for large-scale sequencing of complex disease. We have the tools and we have the sample collections. Now, we just need the funding.